Henderson Javier Alvarez...Wife is Mirley, and the couple has two daughters, Brianna and Kianna...Brother, Anderson, runs the Henderson Alvarez Academy...Started in 2011, the academy is for Venezuelan players, ages 16-18, and provides a structured environment for young ballplayers. Went 9-5 with a 3.58 ERA in 20 games (19 starts) with the Tigres de Quintana Roo of the Mexican League...Also appeared in 10 games (nine starts) for Navegantes del Magallanes of the Venezuelan Winter League (3-6, 6.64 ERA). Made four starts with Miami and three on a rehab assignment with Single-A Jupiter before undergoing season-ending surgery on his right shoulder July 28…went 0-4 with a 6.45 ERA and .311 opponents batting average in his four starts with the Marlins…yielded one home run in 22.1 innings and has surrendered just 17 home runs in 312.0 innings over the last three years…his average of 0.49 home runs per nine innings over that stretch is fourth lowest in the majors among pitchers with at least 300 innings pitched…his opponents batting average included a mark of .250 (10-for-40) against right-handed hitters compared to .360 (18-for-50) with six of his seven walks against left-handed hitters…made all four of his starts at home…went 2-for-6 (.333) with a double and RBI as a hitter…made his first career Opening Day start on April 6 against Atlanta and was the losing pitcher in a 2-1 decision, despite allowing just two runs in 7.0 innings…also took the loss in his next start April 12 against Tampa Bay and was 0-2 with a 4.50 ERA in two starts when he was placed on the 15-day disabled list April 13 with an inflamed right shoulder…was assigned to Jupiter on a rehab assignment and tossed six scoreless innings in a start against Lakeland May 12 (4 h, 5 so)…was reinstated from the DL May 17 and allowed six runs in 5.1 innings that day against Atlanta and six runs in five innings May 22 against Baltimore…took the loss in both outings and combined for an 8.71 ERA before returning to the DL May 23 with the shoulder injury…was sent to Jupiter for another rehab assignment July 15 and went 0-1 with a 3.38 ERA in two starts before his rehab assignment was halted July 22…had surgery July 28 and was transferred to the 60-day DL Sept. 8…was not tendered a contract by the Marlins and became a free agent Dec. 2. Earned first career All-Star nod after completing first half with 6-4 record and 2.63 ERA (120.0 IP/35 ER). Finished season with 12-7 mark and 2.65 ERA (187.0/55) in 30 starts...Season ERA was sixth-best among National League starters, trailing Clayton Kershaw (1.77), Johnny Cueto (2.25), Adam Wainwright (2.38), Doug Fister (2.41) and Cole Hamels (2.46). Marked fifth-lowest by a starter in Marlins history (min. 162.0 IP), behind Kevin Brown (1.89), Jose Fernandez (2.19), Josh Johnson (2.30) and Dontrelle Willis (2.63)...His 1.60 ERA at home led Majors and was third-lowest in Club history, trailing Jose Fernandez (1.19 in 2013) and Josh Johnson (1.57 in 2010)...Established career bests in wins, ERA, complete games (3), shutouts (3) and strikeouts (111)...Went 7-3 with 2.20 ERA (114.2/28) in 18 starts vs. NL East. ERA against division opponents was third-lowest single-season mark against the NL East since 1994, behind Roy Halladay (1.61 in 2010) and Jair Jurrjens (1.69 in 2009). - STATS LLC..According to Elias, Marlins set Club record by winning 10 straight games started by Alvarez from May 16-July 6, surpassing a stretch of nine consecutive wins in starts by Chris Hammond from May 19-July 2, 1993...Became one of six players over last 20 years with at least five shutouts before age-25 season. Alvarez, Clayton Kershaw, Derek Holland, Mark Mulder and Javier Vazquez have five each. Dontrelle Willis had eight...Tied Adam Wainwright and Rick Porcello for MLB lead with three shutouts. Tied five others for seventh in complete games (3), behind Clayton Kershaw (6), Dallas Keuchel and Adam Wainwright (5 each), and Johnny Cueto, Madison Bumgarner and Julio Teheran (4 each)...Shut out Seattle on April 19, Mets on May 6 and Rays on June 3. With Tampa Bay shutout, became first pitcher in MLB history to toss three consecutive shutouts in Interleague play (first IL shutout was no-hitter vs. Detroit on Sept. 29, 2013)...Did not issue a walk over a span of 23.1 innings from May 22-June 15. Ranked fifth among NL starters with a bb/9.0 rate of 1.59...Tied Wily Peralta and Adam Wainwright (min. 162.0 IP) for most GIDPs induced by a NL starter, with 24. Trailed only Dallas Keuchel (36) and Rick Porcello (30) in MLB...Had 2.53 ground ball/fly ball ratio, ranking fifth among all MLB starters, behind Dallas Keuchel (3.63), Justin Masterson (2.89), Tyson Ross (2.81) and Charlie Morton (2.69)...Missed one turn in rotation after suffering left oblique strain on September 1 vs. Mets. Was 2-1, 1.30 (27.2/4) in four starts after return...From May 22 to June 8, had career-long scoreless-innings streak of 26.0 frames, surpassing a mark of 18.0 innings from July 21-31, 2013...Went 3-0 with 1.05 ERA (34.1/4) in five June starts. ERA ranked third in month behind Kershaw (0.82) and Jake Arrieta (0.92)...Had streak of 68.1 innings without allowing a home run snapped in final inning of July 6 start at St. Louis (Kolten Wong). Last home run allowed prior was a lead-off homer by Will Venable on May 11 at San Diego. According to Elias, was longest single-season homerless streak of career, surpassing a 49.0-inning run from July 4-August 11, 2013...In season finale, opposed Jordan Zimmermann and Washington Nationals on Closing Day at Nationals Park on September 28. Suffered 1-0 loss as Marlins were no-hit. Zimmermann's no-hitter came nearly one year after Alvarez's Closing Day no-hitter against Detroit on Sept. 29, 2013 at Marlins Park...Since start of 2013, 0.50 hr/9 rate is ninth-lowest of any Major League starter (min. 500 batters faced)...Also in that time, ranks second among Major League starters in fewest pitches per inning (14.0), trailing only Clayton Kershaw (13.7). Made 17 starts for Marlins, posting a 5-6 record and 3.59 ERA in 102.2 innings pitched (41 ER). Began season on 60-day disabled list with inflammation in right shoulder, coming off DL and making first start on July 4 at Atlanta. Allowed just two home runs in 17 starts, after allowing 17 home runs over first 17 games started for Toronto in 2012. Marked sixth-largest decrease in home runs over first 17 starts of consecutive seasons since 1921, according to STATS LLC. Tossed first career no-hitter and second career complete game on season's final day against Detroit to earn National League Player of the Week honors. Marked fifth no-hitter in Marlins' history and first since Anibal Sanchez on September 6, 2006 vs. Arizona. Marked 282nd in Major League history and became one of six Venezuelan pitchers to have no-hitters, joining Wilson Alvarez, Sanchez, Carlos Zambrano, Johan Santana and Felix Hernandez. According to STATS LLC, closing day no-hitter marked first time in Major League history a no-hitter was secured on a walk-off wild pitch and just fourth no-hitter (including combined) to occur on final day of season. In addition, according to Elias, was just fourth time in Modern Era a no-hitter (combined no-hitters not included) ended on a walk-off. Prior to feat, last time a pitcher had won a complete-game no-hitter in walk-off fashion was on May 15, 1952, when Detroit's Virgil Trucks defeated Washington Senators, 1-0. It was also first no-hitter on Closing Day since 1984, when Mike Witt tossed a perfect game for California against Texas. Owned a career-long scoreless innings streak of 18.0 innings from July 21-31, which tied Jose Fernandez for longest of season by a Marlin. Posted .300 batting average (9x30) with a .500 slugging percentage (3 2b, HR). Average and slugging percentage were highest marks by a pitcher in Club history (min. 35 PA). Made one appearance for Team Venezuela during the World Baseball Classic, tossing 3.0 innings in relief on March 9 vs. Puerto Rico in San Juan (6-3 loss). Allowed three runs on five hits, a walk and a hit batter (9.00 ERA). Led Blue Jays in innings pitched, while 4.85 ERA (187.1 IP/101 ER) was lowest among qualifying Toronto pitchers. Also led Jays with 16 quality starts. Led American League by inducing 30 double plays grounded into and ranked second with a 2.29 GB/FB ratio. Recorded first career shutout on May 4 at Angels, allowing six hits and a walk with three strikeouts. Recorded shutout one day after Brandon Morrow, marking first time in Franchise history that Club recorded back-to-back shutouts on road. Set a career high for strikeouts with seven on September 19 at Yankees and issued five walks for a career high on August 2 at Oakland. Made 10 starts in his first season in the Major Leagues... ML DEBUT: Made his debut on Aug. 10 vs. OAK,receiving a no-decision and coming within one out of a quality start... Held the Athletics to three runs in 5.2 innings in a gamethe Blue Jays would win 8-4 (5.2IP, 8H, 3ER, HR, BB, 4K)... Became the 3rd youngest pitcher to start a game for the BlueJays at 21 years and 114 days old... Jeff Byrd made 17 starts in 1977 at the age of 20 & Phil Huffman made 31 starts in 1978at age 20... ONE TO REMEMBER: Picked up his first Major League win in his 5th start, August 31 at BAL... Tossed eightinnings of three-hit shutout baseball in a 13-0 victory and faced the minimum through seven innings and recorded all but twoouts via ground balls or strikeouts (8.0IP, 3H, 5K)... At 21 years and 135 days became the youngest Blue Jay to earn a victorysince Kelvim Escobar in 1997, and the youngest Blue Jays starter since Phil Huffman in 1979... NO FREEBIES: Walked morethan one batter in only one start walking two on Aug 26 vs. TB... Averaged less than one walk per start, walking only eight in 10starts... Finished the season with 16 consecutive innings without walking a batter... STREAKING: Had a string of 14 consecutivescoreless innings snapped on Sept. 10... The 14 innings consisted of consecutive games on Aug. 31 at BAL (8.0 IP) andSept. 5 vs. BOS (6.0 IP)... Was one inning short of the season club high of 15 consecutive scoreless innings held by Brett Cecilat the time and finished four behind Brandon Morrow for the season high... Was the longest streak by a Blue Jays rookie sinceRicky Romero tossed 24 scoreless in 2009... KEEP IT ON THE GROUND: Finished his minor league season with a groundball/fly ball ratio of 1.70 and posted a GB/FB ratio of 1.98 in 10 Major League starts... Club leader Ricky Romero was at 1.85,and only three AL starters posted a number better than 1.98 in 2011 (Cahil, Carmona, Masterson)... MINOR NOTES: Beganthe season with Dunedin of the Florida State League (A), making two starts (0-1, 6.48) before moving to New Hampshire (AA)...Made 15 appearances (14 starts) with New Hampshire of the Eastern League (AA), posting an 8-6 record with a 2.86 ERA...In his last six minor league appearances (five starts) at New Hampshire posted a 4-0 record with a 2.08 ERA, walking only fourin 34.2 innings... FUTURES STAR: Appeared in the MLB All-Star Futures Game for the second consecutive season... Tossedone scoreless inning, allowing one hit. Pitched the entire season with Dunedin of the Florida State League (A)... OUT OF THE GATE: Wasdominant in the first half of the season, posting a 5-2 record with a 2.78 ERA... Allowed only one run in his first four starts,going 3-0... Had five outings in the first half where he did not allow an earned run... Fell to 3-5 with a 6.00 ERA after theAll-Star break... HONOURED: Was named to the Florida State All-Star game and participated in MLB XM Futures Game. Made 23 starts, and led Lansing (A) in wins with nine... Named to the Midwest League Mid-Season All-Star Game...Earned Lansing Star of the Month honours for May, going 3-1 with a 1.89. Made his debut with the Gulf Coast Blue Jays (R), picking up is first win in his 5th start... Walked only six batters in 46.1 IP. 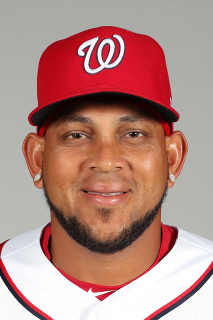 April 13, 2019 RHP Henderson Alvarez III assigned to Fresno Grizzlies from Auburn Doubledays. April 2, 2019 RHP Henderson Alvarez III assigned to Auburn Doubledays from Fresno Grizzlies. December 6, 2018 RHP Henderson Alvarez III assigned to Fresno Grizzlies. November 16, 2018 Washington Nationals signed free agent RHP Henderson Alvarez to a minor league contract. November 16, 2018 RHP Henderson Alvarez III roster status changed by Washington Nationals. March 22, 2018 RHP Henderson Alvarez assigned to Tigres de Quintana Roo. January 14, 2018 RHP Henderson Alvarez loaned to Navegantes del Magallanes from Aguilas del Zulia. December 30, 2017 RHP Henderson Alvarez transferred to Aguilas del Zulia from Tiburones de La Guaira. October 9, 2017 RHP Henderson Alvarez assigned to Tiburones de La Guaira. October 6, 2017 RHP Henderson Alvarez elected free agency. September 13, 2017 Philadelphia Phillies selected the contract of RHP Henderson Alvarez from Lehigh Valley IronPigs. August 25, 2017 RHP Henderson Alvarez assigned to Lehigh Valley IronPigs. August 22, 2017 Philadelphia Phillies signed free agent RHP Henderson Alvarez to a minor league contract. October 7, 2016 RHP Henderson Alvarez elected free agency. October 7, 2016 Oakland Athletics sent RHP Henderson Alvarez outright to Nashville Sounds. August 30, 2016 Oakland Athletics sent RHP Henderson Alvarez on a rehab assignment to Stockton Ports. August 27, 2016 RHP Henderson Alvarez assigned to AZL Athletics. June 25, 2016 Oakland Athletics transferred RHP Henderson Alvarez from the 15-day disabled list to the 60-day disabled list. Recovering from July 2015 right shoulder surgery. June 18, 2016 Oakland Athletics sent RHP Henderson Alvarez on a rehab assignment to Nashville Sounds. June 13, 2016 Oakland Athletics sent RHP Henderson Alvarez on a rehab assignment to Stockton Ports. May 5, 2016 Oakland Athletics sent RHP Henderson Alvarez on a rehab assignment to Nashville Sounds. April 30, 2016 Oakland Athletics sent RHP Henderson Alvarez on a rehab assignment to Stockton Ports. April 25, 2016 Oakland Athletics sent RHP Henderson Alvarez on a rehab assignment to Nashville Sounds. April 20, 2016 Oakland Athletics sent RHP Henderson Alvarez on a rehab assignment to Stockton Ports. December 28, 2015 Oakland Athletics signed free agent RHP Henderson Alvarez. December 2, 2015 RHP Henderson Alvarez elected free agency. November 4, 2015 Miami Marlins activated RHP Henderson Alvarez from the 60-day disabled list. September 20, 2015 RHP Henderson Alvarez assigned to Tiburones de La Guaira. July 15, 2015 Miami Marlins sent RHP Henderson Alvarez on a rehab assignment to Jupiter Hammerheads. May 17, 2015 Miami Marlins activated RHP Henderson Alvarez from the 15-day disabled list. May 12, 2015 Miami Marlins sent RHP Henderson Alvarez on a rehab assignment to Jupiter Hammerheads. April 13, 2015 Miami Marlins placed RHP Henderson Alvarez on the 15-day disabled list. Right shoulder inflammation. October 9, 2014 RHP Henderson Alvarez assigned to Tiburones de La Guaira. August 16, 2014 Miami Marlins activated RHP Henderson Alvarez from the 15-day disabled list. December 1, 2013 RHP Henderson Alvarez assigned to Tiburones de La Guaira. July 4, 2013 Miami Marlins activated RHP Henderson Alvarez from the 60-day disabled list. June 23, 2013 Miami Marlins sent RHP Henderson Alvarez on a rehab assignment to Jacksonville Suns. June 13, 2013 Miami Marlins sent RHP Henderson Alvarez on a rehab assignment to Jupiter Hammerheads. May 7, 2013 Miami Marlins transferred RHP Henderson Alvarez from the 15-day disabled list to the 60-day disabled list. Right shoulder inflammation. March 31, 2013 Miami Marlins placed RHP Henderson Alvarez on the 15-day disabled list retroactive to March 27, 2013. Mild right shoulder inflammation. March 27, 2013 Henderson Alvarez roster status changed by Miami Marlins. August 9, 2011 Toronto Blue Jays selected the contract of Henderson Alvarez from New Hampshire Fisher Cats. May 19, 2011 Henderson Alvarez assigned to New Hampshire Fisher Cats from Dunedin Blue Jays. May 9, 2011 Henderson Alvarez roster status changed by Dunedin Blue Jays. April 6, 2011 Dunedin Blue Jays placed RHP Henderson Alvarez on the 7-day disabled list. January 7, 2011 Toronto Blue Jays invited non-roster RHP Henderson Alvarez to spring training. October 8, 2010 RHP Henderson Alvarez assigned to Tiburones de La Guaira. September 1, 2010 Dunedin Blue Jays activated RHP Henderson Alvarez from the 7-day disabled list. August 13, 2010 Dunedin Blue Jays placed RHP Henderson Alvarez on the 7-day disabled list. April 7, 2010 RHP Henderson Alvarez assigned to Dunedin Blue Jays from Lansing Lugnuts. September 29, 2009 Lansing Lugnuts activated RHP Henderson Alvarez from the 7-day disabled list. August 16, 2009 Lansing Lugnuts placed RHP Henderson Alvarez on the 7-day disabled list. April 8, 2009 RHP Henderson Alvarez assigned to Lansing Lugnuts from GCL Blue Jays.